I know you are probably up to your ears in left over Halloween candy, and the last thing you want to think about is making your own candy….but I promise you, these are worth it! 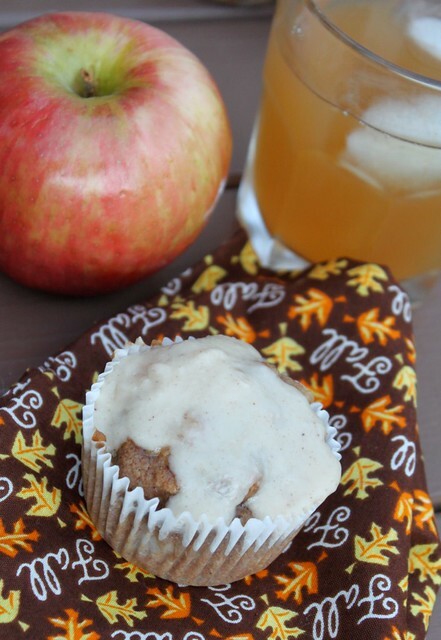 This recipe has been circulating the internet for over a year, and despite coming from THE Smitten Kitchen, I was still a bit hesitant as to whether these would actually taste like apple cider. Well my friends, I can attest to ahhhmazingness of these caramels. Somehow, magically, they do indeed taste like apple cider. (Or maybe not so magically….you do use an entire quart of the stuff and boil it down to a mere 1/3 cup to infuse the caramel with cider flavor). I actually had made these for our pumpkin carving party, but because of the unpredictable nature of intern year (and medicine in general), I was 2 hours late to my own party…. so instead, I have been enjoying these myself for the past 2 weeks. 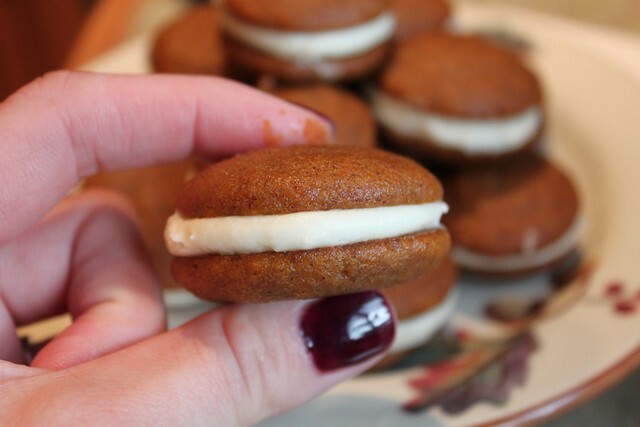 (Good thing I’m not the dentist in the family…) I also insist that everyone who comes to our house tries at least one – and the response is always the same….”ahhhhmazing.” So before cider is gone until next fall, make these. You won’t regret it. Boil the apple cider in a 3- to- 4- quart saucepan over high heat until it is reduced to a dark, thick syrup, between 1/3 and 1/2 cup in volume, stirring occasionally. This took about 1 hour on my stove. Line the bottom and sides of an 8- inch straight- sided square metal baking pan with 2 long sheets of crisscrossed parchment, then butter. Set it aside. Stir the cinnamon and flaky salt together in a small dish. Once you are finished reducing the apple cider, remove it from the heat and stir in the butter, sugars, and heavy cream. Return the pot to medium- high heat with a candy thermometer attached to the side, and let it boil until the thermometer reads 252 degrees, about 5 minutes. Do not take your eyes off it as it burns quickly. Immediately remove caramel from heat, add the cinnamon- salt mixture, and give the caramel several stirs to distribute it evenly. Pour caramel into the prepared pan. Let it sit until cool and firm—about 2 hours, though it goes faster in the fridge. Once caramel is firm, use your parchment paper sling to transfer the block to a cutting board. Use a well- oiled or buttered knife to cut the caramel into 1-by-1-inch squares. Sprinkle with additional flaky sea salt if desired. Wrap each one in a 4-inch square of parchment or waxed paper twisting the sides to close. 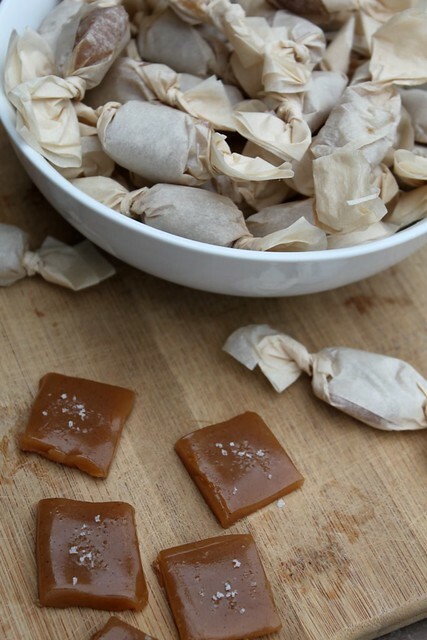 Caramels will be somewhat on the soft side at room temperature, and chewy/firm from the fridge. 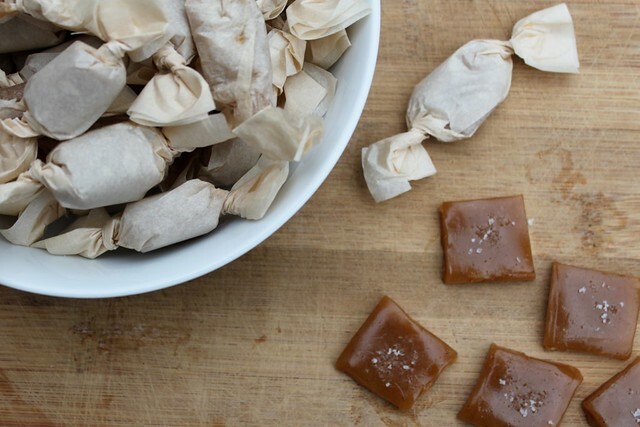 Caramels keep, in an airtight container at room temperature. 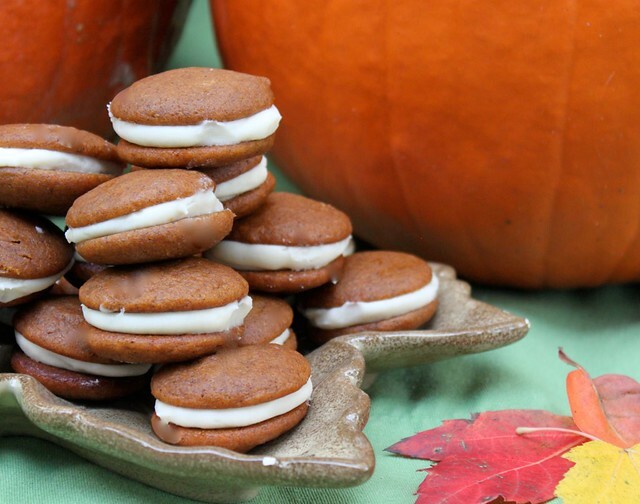 While it may be the end of October, it’s certainly not the end of fall inspired treats. I made these for a trip down to Lexington to see some of our best friends, and they were definitely a big hit. I knew Samiya in particular would like them because, well, because they’re cute and little and involve pumpkin! Moving to a new place, with new people, has really made me miss the awesome friends we had in med school. Following college, I moved to Louisiana with three crazy awesome roommates, and there was pretty much a constant source of entertainment and adventure at our house (and in Louisiana in general). Then in medical school, our apartment complex was basically like a grown-up college dorm, where study groups, dinner parties and watching people play video games was always only a step away. It’s a lot different now, living in a neighborhood, with friends scattered all over, and schedules that are completely different because of residency. But I guess that’s just part of growing up, and it’s not so bad. 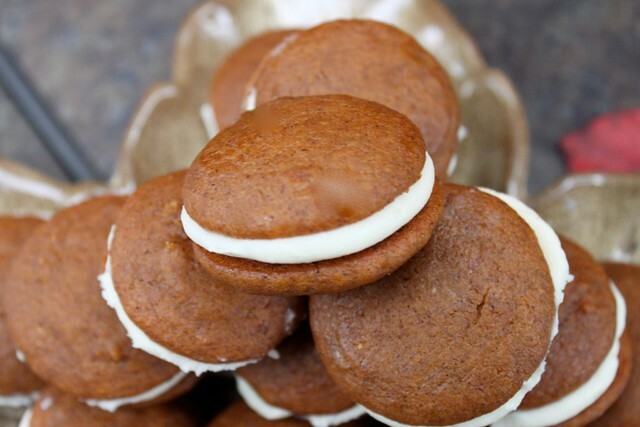 Now these pumpkin whoopie pies were described as a pumpkin cupcake in a different form, and I’d say that’s pretty close to accurate! The batter is a bit more dense than a cupcake, but just as moist, and the filling is strikingly similar. Truthfully, can you go wrong with cream cheese frosting? I really liked these because they are visually appealing, and easy to eat…which turned out to be both a good and bad thing. Just glad I had people to help me finish them off :-). To make the pumpkin cookies, preheat the oven to 350° F. Line two baking sheets with parchment paper or silicone baking mats. In a large bowl, whisk together the flour, salt, baking soda, baking powder and spices. Set aside. In a separate bowl, whisk sugars and oil together. Add the pumpkin puree and whisk to combine thoroughly. Add the eggs and vanilla and whisk until combined. Sprinkle the flour mixture over the pumpkin mixture and whisk until completely combined. Transfer the cookie batter to a pastry bag fitted with a large plain round tip. Pipe small rounds of the batter onto the prepared baking sheets, about 1½-2 inches in diameter. If desired, smooth the top of cookies with a few drops of water and the bottom of a spoon. Bake for 10-12 minutes, until the cookies are just starting to crack on top and a toothpick inserted into the center of a cookie comes out clean. Remove from the oven and let the cookies cool on the pan for about 10 minutes. Transfer to a wire rack to cool completely. Repeat with remaining batter. To make the filling, combine the butter and cream cheese in the bowl of an electric mixer. Beat on medium-heat speed until smooth, about 1-2 minutes. Add the powdered sugar, maple syrup and vanilla and beat until smooth. Be careful not to overbeat the filling or it will lose structure, if this occurs refrigerate for 20 minutes. Transfer the filling to a pastry bag fitted with a plain tip. 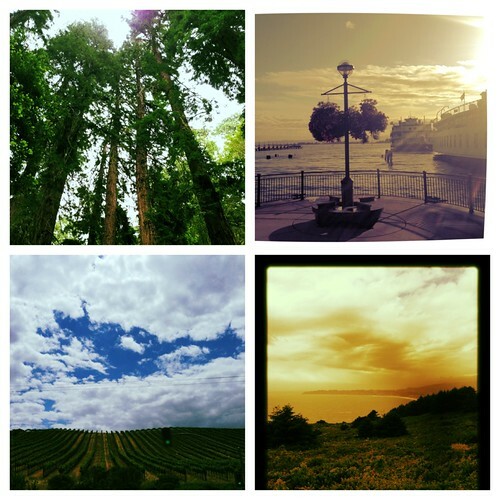 So, you know my previous obsession with California? Well, because we’ve had the most amazing weather for the last month, I’m starting to realize that Ohio is pretty awesome! The leaves are starting to change, there is fog over the valleys when I drive to work, and the sun has that autumn glow. It’s wonderful! Although you will surely need to remind me of this come February, when I cannot wait for winter to be over! To keep my California dream alive, my best friend from like the fourth grade just landed a coveted fellowship spot at UCLA, so I’m quite sure my love will be rekindled when I go to visit. But for now, I’m loving Ohio. Now about these muffins. Obviously, they totally go with October, but they would be equally perfect for Thanksgiving breakfast. 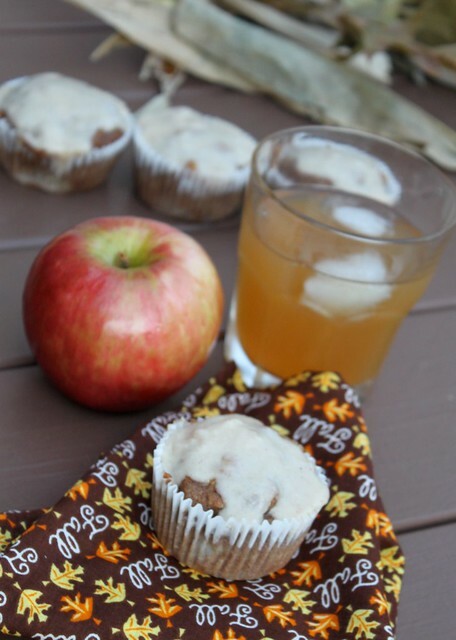 They are actually pretty healthy – chunks of apple and apple sauce keep them very moist without much fat. Then of course you add this browned butter glaze, which sort of ruins the healthy aspect, but you absolutely cannot leave it off. It is amazing. Together, these were best apple muffins I’ve ever had. A few technical points…. First, you precook the apple with a bit of sugar and spice. This step gives the apples a pie-like texture, instead of the dehydrated apple you find in some baked goods. Additionally, I found out the hard way that there are so many liquid components to these, that they will seep if allowed to sit in an air tight container. I’m quite sure this didn’t make the best presentation when John brought them into class, but apparently they were still well loved. To avoid this, go a little lighter on the amount of apple in the batter, and store with a rack underneath. These muffins are just hearty enough that you can call them breakfast without too much guilt. Begin by melting the butter in a small skillet over medium heat. Continue to cook, swirling occasionally until the butter turns a deep golden brown. Be careful not to burn. *Repeat this step for the browned butter in the glaze. In a large bowl, whisk egg and brown sugar together until smooth and no lumps remain. Add in vanilla extract, butter, apple sauce and apple cider, whisking again until smooth. Gradually add in dry ingredients, mixing until just combined. Fold in diced apples. Do not overmix. Fill each muffin liner 3/4 full to scantly full. Bake for 15-17 minutes, or until tops slightly golden. When cool enough to handle, transfer to a wire rack to cool. In a medium bowl, combine browned butter, vanilla extract and powdered sugar. Whisk until the mixture comes together then add in 1 tablespoon of apple cider, continuing to mix. If it still doesn’t appear glaze-like, add in cider 1/2 tablespoon at a time and mix again. Don’t worry if it becomes too liquidy – just add a tiny bit of powdered sugar until you get the desired consistency. Spoon glaze on warm muffins or dip each top in the glaze, then serve. Let me just profess how incredibly happy I am that it is October! Not only for the amazing weather, the change of leaves, and a special someone’s birthday, but also because my work schedule is much more manageable, and I actually have a few minutes to breathe. Of course at the top of my weekend to do list was celebrating the season by making baked goods! My friend Val also happens to be very found of October, seasonal festiveness and baking, so I knew pumpkin spice doughnuts would be right up her alley. I actually felt like a normal person, chit chatting on a Saturday afternoon, experimenting in the kitchen, and enjoying fall. It was so much fun! Truth be told, I had bought a doughnut cutter specifically for these doughnuts more than a year ago, and had yet to use it. 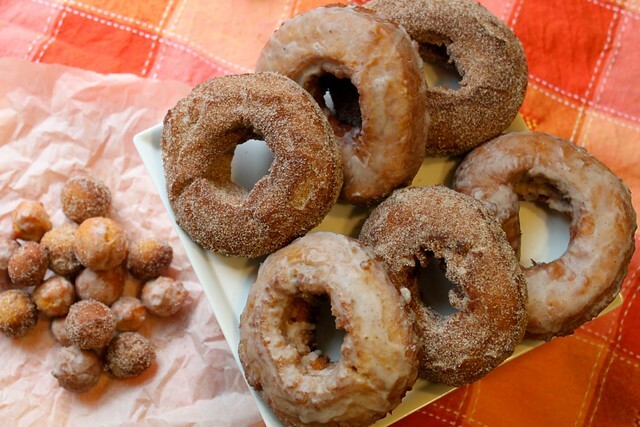 Fall passed me by, and making pumpkin doughnuts in December just seemed wrong. We found that the doughnuts “holes” made with the cutter were much larger than expected, so we ended up cutting them into fourths and making more snack size bites. Now, I know people “bake” doughnuts, and that is much healthier, but let’s be honest, by definition doughnuts are fried. I’m not about to go redefining the very essentials of a doughnut by baking them, so yes, I fried these. Healthy? No. Guilty pleasure? Yes. I have only fried things one other time in my life, and it was pretty much the worst disaster I’ve had yet in the kitchen. (Picture an apartment so smoke filled you couldn’t reenter it for hours….). Happy to say this time went much more smoothly. The only difficult part is getting the oil to stay at the right temperature. Don’t be tempted to turn the heat to high – stick with medium – and use a heavy duty pan, like cast iron, that will keep consistent heat. Overall, these were considerably easier than I was expecting, but just as fun and festive as I was hoping. In a medium bowl, whisk together the flour, baking powder, baking soda, salt, cinnamon, ginger, nutmeg and cloves and set aside. In the bowl of a stand mixer fitted with the paddle attachment, beat together the sugar and butter until well blended. Add egg, then yolks and vanilla. Add the pumpkin mixture and stir. Alternating buttermilk and flour mixture, continue to mix until all ingredients added and well blended. Cover the mixture and freeze for 1 hour, or refrigerate for 3. Line two baking sheets with parchment or wax paper and lightly flour your work surface. Gently roll dough to about 1 – 1.5 cm thickness. Using a floured doughnut cutter or 3-inch round cutter, cut out dough rounds. If needed, use a floured 1-inch cutter to remove the centers (or the bottom of a 1 m piping tip). Arrange the doughnuts and holes on the prepared baking sheets, and if possible chill until ready to fry. Gather dough scraps and continue cutting until all the dough is used. Line a cooling rack with several paper towels. Add enough oil to a skillet or Dutch oven to reach a depth of 1 – 1½ inches. Heat oil until the temperature reaches 365º to 370º. Fry doughnuts a few at a time, adjusting heat as needed to maintain temperature, until golden brown, about 2 minutes per side. Fry doughnut holes in a couple batches, turning occasionally, until golden brown, about 3 minutes. 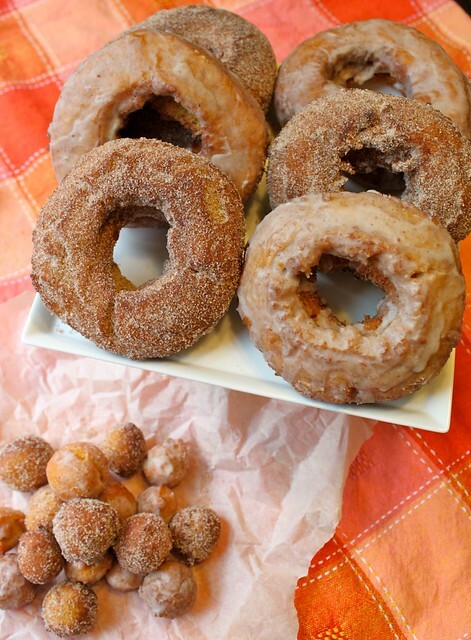 Use a strainer to transfer doughnuts to paper towels. To make the cinnamon-sugar, whisk together the cinnamon and sugar in a small, shallow bowl until combined. When doughnuts are cool enough to touch, dip in cinnamon-sugar mixture and turn to coat completely. Make the spiced glaze by combining powdered sugar and spices in a small bowl. Add the milk and whisk to combine, until a thick glaze is formed. Add more milk as needed to achieve desired consistency. Dip the remaining doughnuts in the glaze and allow to set before serving. Every once in a while I see a recipe and immediately feel the need to make it that very same day. This would be one of those recipes. With an absolutely beautiful September behind us, and what I’m hoping will be an even more beautiful October ahead, I couldn’t pass up a recipe that so perfectly matched this fall weather. It helps that there’s only about 5 ingredients and that from start to finish this only took about 20 minutes. Residency + a long commute + triathlons + general career/life crises have been taking up pretty much all my time, and blogging hasn’t been at the top of my list…but truth be told, I miss it! You know this sandwich must be pretty great, considering it made me come out of blog hibernation. In fact, it really makes me want to go apple picking and drink cider. 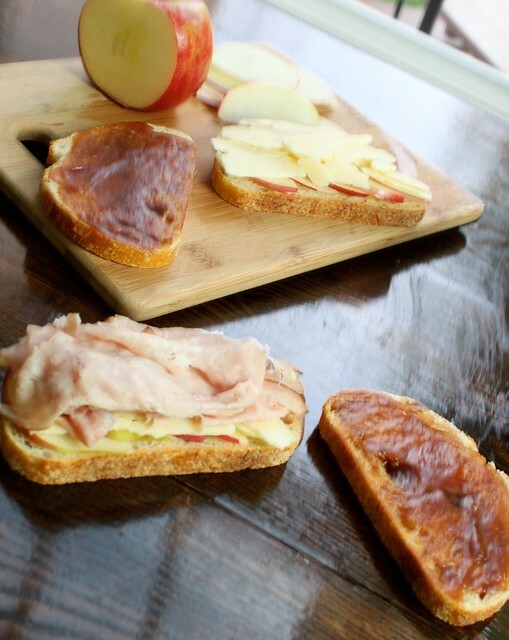 The combination might sound a bit odd, but the apple and apple butter is really a nice balance to the saltiness from the ham and cheese. Plus, I love adding sweetness to anything I can. So if you’re looking for a quick an easy dinner to enjoy with fall, look no further. Heat a grill pan or case iron skillet to medium heat. Butter the outside of each sandwich liberally. 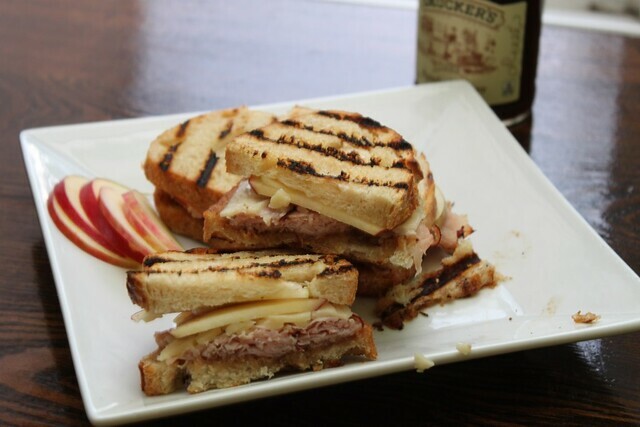 On one piece of bread, layer apple slices, cheese and ham. On the other slice apply a thick layer of apple butter. Sandwich the pairs together so that the buttered sides are facing outwards. Cook the sandwiches, turning once, until both sides are golden and the cheese is melted. Slice in half and serve immediately. So I apologize that this post is not really recipe related, but I figure maybe someone out there would be interested in what life is like as a matched fourth year medical student. In case you don’t get this from the post, in the words of Barney Stinson it’s legen… wait for it…… dary. It’s a pretty great feeling to have so much freedom after 3.75 years of being a slave to the books. Lately, I’ve seen a few second year med students post about doing UWorld questions while preparing for Step 1 (the most stressful test I’ve ever taken in my life), and I just want to tell them… It gets better, so much better! So let this post be a testament to that! 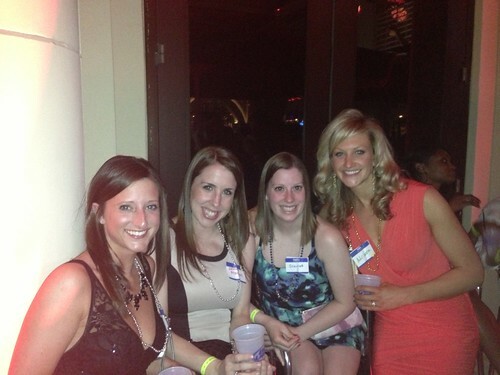 While John was finishing up classes, I had the pleasure of going to a med school friend’s bachelorette in Vegas. While I previously have claimed that “Vegas isn’t really my scene”, this trip proved me wrong. 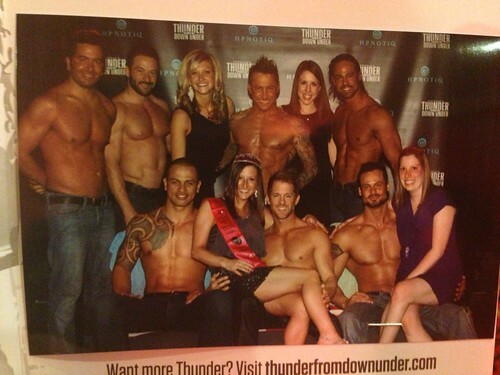 We did all the vegas-y things that 20-sometthings do, including this…. When I got back, it was a few days of real life, before I made a trip to Columbus to see one of my best friends. It just so happened she had the weekend off, AND there was an elaborate birthday extravaganza planned on the Santa Maria. 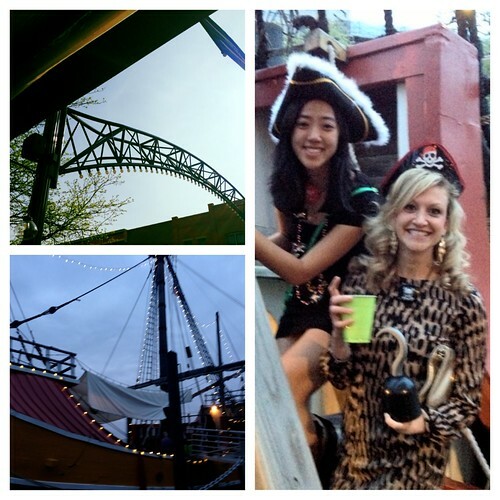 I’ll have to say, everyone really took the pirate theme to heart, and it made for a really fun party. Then I sort of last minute booked my trip to San Francisco to see my roomies from college. 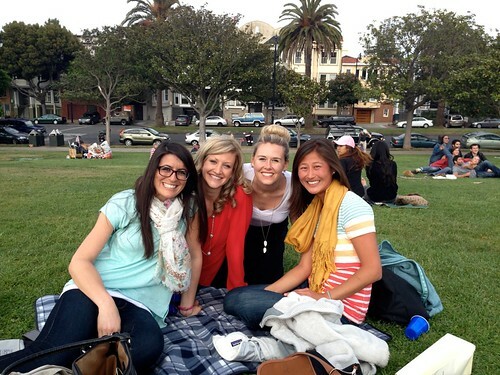 The picture below is in Dolores park, with 4 girls who all met through PWild, a 2 week wilderness backpacking adventure before college started. My love affair with California is still going strong. We packed a lot into a few days thanks to our amazing tour guide, who also happens to be finishing up business school. We started the weekend with dinner and drinks in Oakland, and I’m still dreaming about the garden gimlet with crushed cucumber and hand muddled mojitos of that night. Then we hit up Muir woods, hiked to Stinson beach, and finished the day off in Dolores Park. Emily and I used the time change to our full advantage and were waking up around 6 – which gave me the chance to join all the other runners down at the embarcadero. And we even made a trip up to Napa and Sonoma. So much diversity in such a small area. So at least for now, I’ve still got my sights set on California! When I got back, it was a day full of packing, and the big move to Cleveland! We stored all our stuff in a pod, and about 20 hours before we left for Italy, I realized that I had stored my Passport away in that pod full of tightly packed stuff. 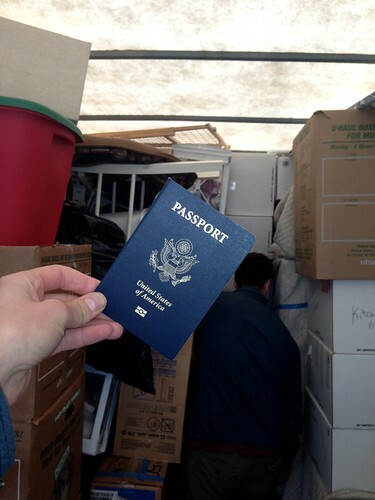 By some miracle, the pod was moved to a reachable location, and we were able to sneak onto the property, unpack the pod, and recover the passport. I kept saying, “I can’t believe I did that!” but really, I totally can. Sorry John, take the good with the bad I guess :-). And then John and I left together for our 2 weeks in Italy! 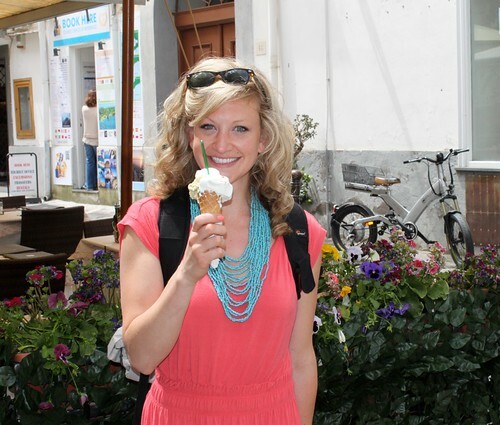 We had a really hard time deciding where we wanted to go as a graduation trip, but ultimately we thought Italy offered the most of the things we were interested in – good food, gorgeous views, pretty hikes, and good wine :-). We started the trip in Tuscany, and stayed in an old 8th century village that was converted to a hotel. 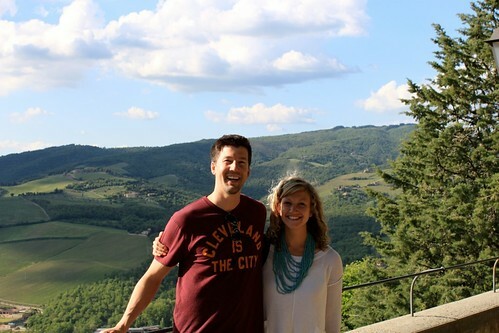 We visited several small towns, and some bigger ones like Siena. 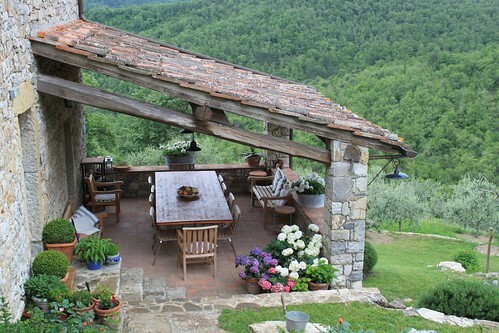 It was kind of crazy to think about the fact that Tuscany is like Italy’s version of farmlands. Wine and olives instead of corn and soybeans. I think I could deal with that :-). My absolutely favorite part of this trip was the cooking class we took from 2 Italian sisters, who hosted us in their home. We heard about them through Backroads , and you can find them at Tutti a Tavola. This is their personal patio, and yes that is a field of olive trees right on their land. We even bought a liter of olive oil, pressed on their property, to bring home. 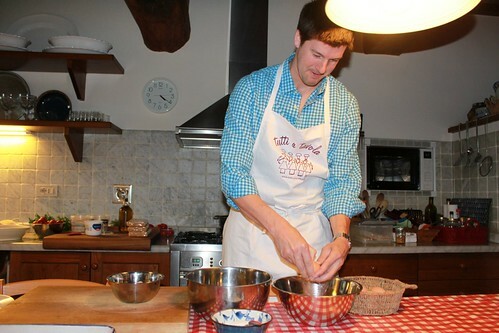 It was just really neat to be in an actual Tuscan home, cooking actual tuscan food. 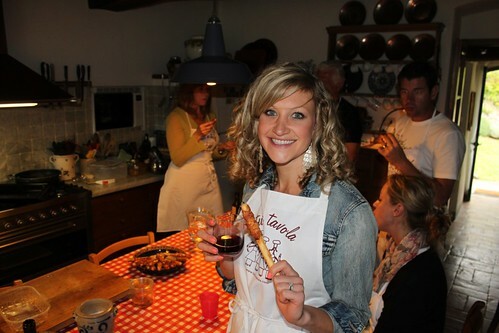 We had a wonderful 5 course dinner, and had so much fun preparing it together. We started with grissini (crunchy italian breadsticks), covered with thin pancetta and then rolled in a mix of brown sugar and crushed red pepper. 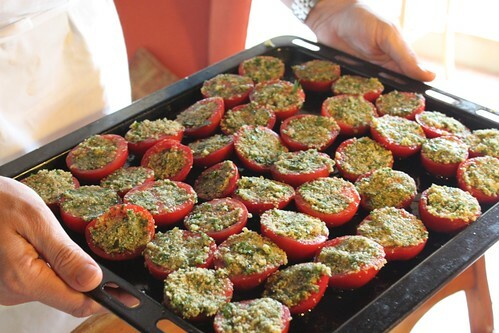 Then we roasted tomatoes filled with breadcrumbs, parsley, garlic and of course olive oil. These eventually got mixed with pasta, but they would be fabulous on their own as well. 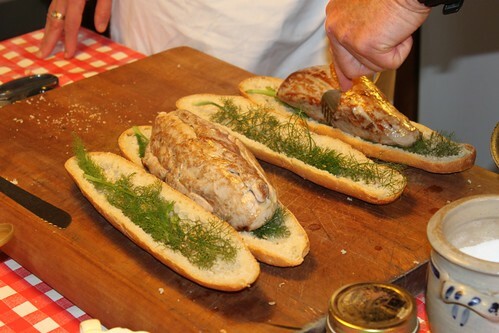 Then we had pork loin, literally encrusted in italian bread and fennel. And of course John helped with the Tiramisu. We met 2 girls from San Francisco a couple from denver, and another couple from Australia. It was such a fun and interesting evening. 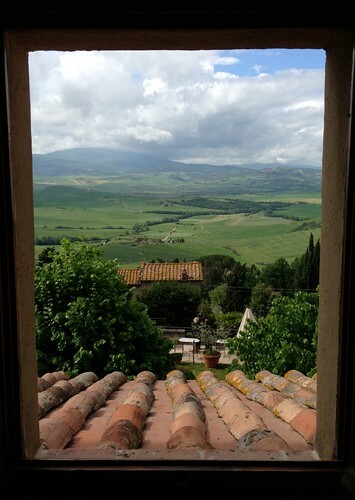 We headed over to Pienza the next day, and enjoyed this view from our window. Literally everywhere you look in Tuscany is right off a post card. This was from the hillside town of Montepulciano. After a few more days of wine tastings, and visiting beautiful countryside towns, we headed down to the coast. 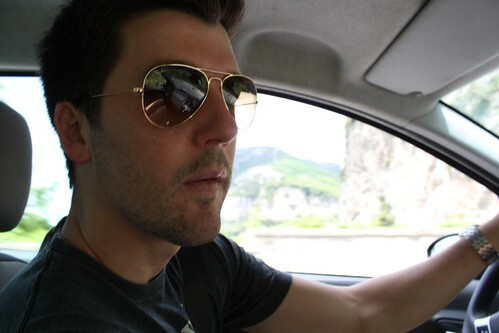 I seriously don’t know how John drove on all the crazy roads with crazy Italian drivers, but he never once complained and even seemed to enjoy it. I wouldn’t have lasted 2 minutes. When we left the states, my mom cried. When we got back, she told us it wasn’t because she was sad to see us go, but because she was so worried about John driving along the Amalfi coast. It is pretty harrowing, thank goodness he likes to drive stick shift, because I can’t imagine driving there with an automatic. 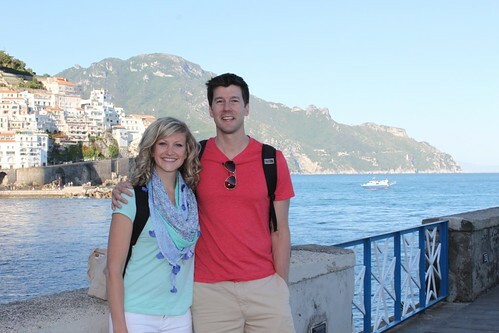 We checked out Sorrento, Positano, Amalfi, Ravello and a few smaller towns, but Positano was by far my favorite. I think my second favorite part of the trip was a hike we did called “Footpath of the Gods” or Sentiero degli dei. 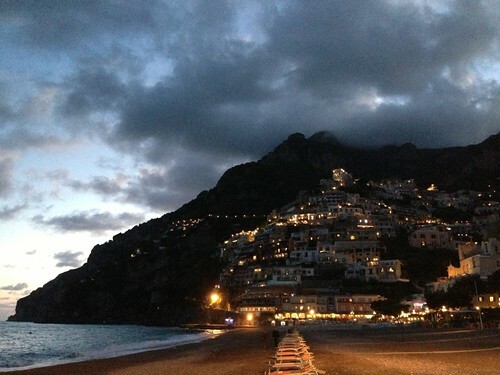 It was about a 6 mile hike from Bomerano, into Positano. It started off a little rough because we somehow missed the initial sign starting the trail, and ended up walking about 4 miles before finally getting back to the starting point. Once we actually got on the trail it was an easy, well marked hike, with beautiful views. 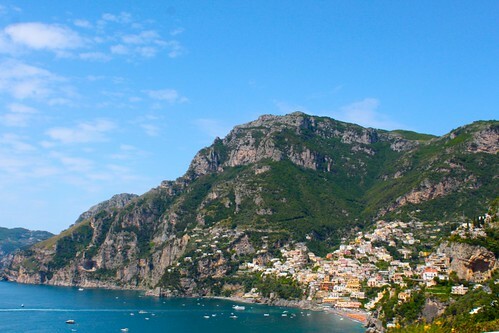 For being called “The Amalfi Coast”, the actual town of Amalfi was really nothing to write home about. But we still of course took the obligatory picture. 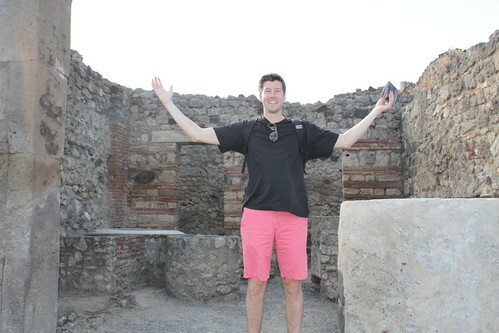 We also took a one day trip to Pompei and Mount Vesuvius, which truthfully I didn’t know anything about, and so wasn’t really expecting much. It ended up being awesome! Pompeii is the largest archeological site IN THE WORLD. It is an entire town from the six or seventh century BC that became preserved under ash when Mount Vesuvius erupted in 79 AD. John is standing in front of what used to be a “fast food joint” in the town. Literally, they made food, and people would take it to go! They also had “plumbing systems” (in BC times people! ), and shops, amazingly elaborate houses, and of course the standard gymnasiums, bath houses, amphitheater, that I always associate with Roman times. 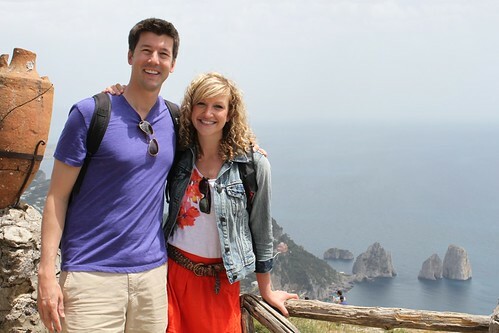 We packed a lot into the trip, and even made it over to the Isle of Capri for our last night. I didn’t want to bore you with too many details, but I didn’t even begin to cover everything we did! If you have any questions about planning a similar trip, be sure to let me know! Overall, it was a really nice getaway for just the two of us before I start residency. It was filled with a lot (probably too much) pasta, wine and gelato, but we both enjoyed every second :-). You know the saying, “If you want something done, give it to a busy person?” Well in the past month, I have found that this saying is pretty much spot on. Somehow when I was working 10-12 hour days, studying for shelf exams, running, being a wife, and taking care of a puppy, I had time to post all these new things I made. Then second semester fourth year happened, and for the first time since I can remember, I have a lot of free time, yet I have posted almost nothing on this blog! It’s really true, when you are busy, you just get more done! That being said, it’s not like I haven’t been in the kitchen. I have been trying out lots of fun recipes – everything from making my own greek yogurt, tiramisu cupcakes, shrimp enchiladas and the very delicious but dangerous blackberry pie bars– I just didn’t get any pictures! So finally, here’s a new recipe just in time for the summer-like weather. I loved this dinner because it’s healthy enough that you feel good about eating it, but the avocado cream sauce gives it just a touch of sass that still makes you feel like your cheating. And if you really feel like being rebellious, I think it would go great with these cookies. *To Roast the Red Peppers: Preheat oven to 475°. Line a baking pan with aluminum foil Coat the outside of each pepper with olive oil. Cook the peppers for about 20 minutes, turning occasionally, until the skin is lightly browned. Remove from oven and pull aluminum foil around the peppers. Allow to cool for at least 20 minutes, then peel of skin and remove seeds. Can be done several days in advance and stored in the refrigerator. 2. Stir in the cornmeal or panko, a bit at time, mixing lightly just until the mixture firms up. (Pick up a bit and see if it can be easily molded into a ball. If it is too sticky, add a little more. I ended up needing at least 1 cup). Chill the mixture for 30 minutes. 3. While the bean mixture is chilling, make the corn relish. Heat the canola oil in a medium skillet over medium-high heat. Add the corn to the pan and sauté briefly until lightly browned, 2-3 minutes. Stir in the garlic and jalapeño and cook just until fragrant, about 1 minute. Transfer the mixture to a bowl. Stir in the tomato, lime juice, and cilantro. Season with salt and pepper to taste. 4. To make the avocado cream sauce, combine all ingredients in the bowl of a food processor or blender. Process until completely smooth. 5. 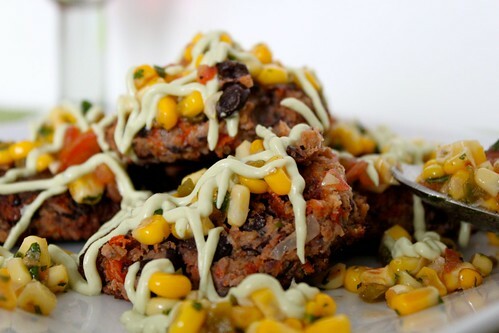 Form the bean mixture into patties approximately 3½ inches in diameter. Heat about 2 tablespoons of canola oil in a large skillet over medium heat. Add the patties in batches, cooking until lightly browned and firm, about 3-4 minutes per side. 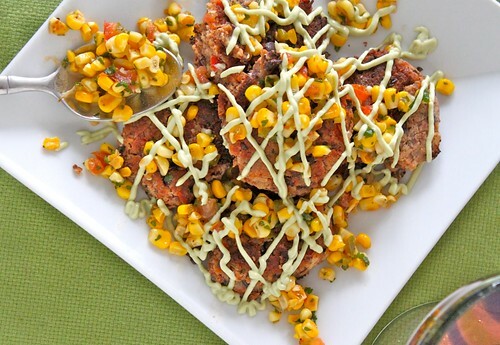 Serve the patties warm topped with the corn relish and drizzled with the avocado cream sauce.